A Bank Holiday weekend bonus post for you – on my recent “rationalisation” of the to-be-read pile. When I was little, when mum wanted us to have a tidy up and clear out of our rooms, she would call it a rationalisation. I think this was mostly because Little Sister and I were extremely loath to throw anything away, so if we thought that we’d have to we’d kick up a stink. But a rationalisation was different (or so my mum said) we were just looking to make sure we had what we needed – no duplication etc. She’s cunning my mum. Thus a clear out for me is always called a rationalisation. It sounds less scary, less final – more productive. 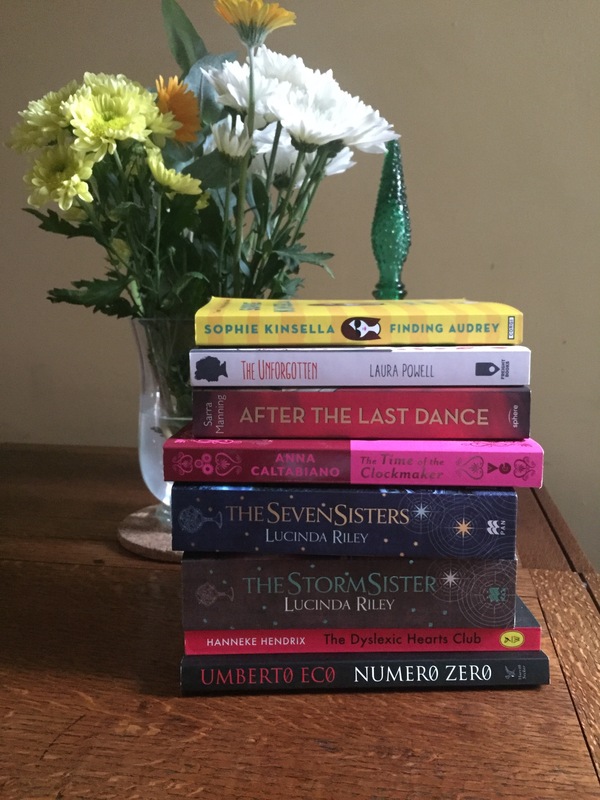 So my to-read pile has got a little out of hand – even for me, so on a recent Saturday night, after I’d finished the book that I was reading I had a round of the 50 pages and out reading challenge to help get the to-read bookshelf down. The challenge is fairly self-explanatory – you give a book 50 pages – and if you’re not hooked or don’t care by that point you can give it up and put it on the charity shop pile. Some of the books didn’t need 50 pages. This doesn’t mean that they’re bad books, it just means they’re not for me. Often it means they come under the “Verity tries to kid herself that she’ll read literary fiction” banner. Because we all know that if given a choice, I’ll go for romance, or crime, or historical fiction, or comic fiction over award winning books. You’ve seen my Week in Books posts, you know the score. Some of the 50-pages and out victims – nothing wrong with them, just not for me. Then I took to the piles behind the sofa. I did this while The Boy was at work, so he couldn’t see how bad it had got. I have a magpie’s eye for books. I’m always picking up more and I have various different sources for them – many are second hand, or review copies – so I often haven’t paid anywhere near jacket price for them. * I yank them all out, inspect what’s there, hope there aren’t any duplicates in the pile (it has happened) and then have a weed. What literary fiction have I picked up thinking “I’ll read that some day” and then ignored in favour of pretty much everything else? Which books are in there by an author that I’ve got fed up of or have overdosed on? Which ones would I take on holiday with me to read, and then end up ignoring them in favour of the Kindle all week? *** Which are later books in series that I could read if only I pulled my finger out and read the earlier ones? Which have been sitting in that pile for ages, not getting moved onto the to-read bookshelf because there’s always something I fancy more? Which, if I’m being really very honest with myself, am I never going to get around to? I’m not good at this part. But I don’t have time to give all of these 50 pages. I keep make a new pile of candidates for the 50-pages and out challenge – the ones where there is a realistic chance that I’ll like them enough to keep reading – and give that a prime spot near the front of the sofa arm.. But some, after careful consideration, I move straight to the charity shop bag. Then I reform the piles – trying to move some of the older stuff to the top, to sort it into genres and sizes and hide it all behind the sofa again. *Which is obviously a good thing or I’d be wasting money hand over fist,** which wouldn’t be good. **I do sometimes wonder if the to-read pile would be any better if I did have to pay for all my books, and then I remember that when I moved to Essex I took 7 books with me, and when I moved back to Northamptonshire 3 years later I brought nearly 80 back with me – and that was after having held a cull before moving and having got rid of some as I went a long. So having to pay full price doesn’t stop the book acquisition – even when (as I was at that point) I have a *very* tight budget. *** It happens. I take something literary fiction-y on holiday with me to force myself to read it, and then I end up ignoring it in favour of the kindle – reading backlog or buying more books in series – and then bring it home, unread, but well travelled. I love this post! After 32 years I’m beginning to think I may have sometimes achieved as a parent. Please may I have the Umberto Eco though……. and perhaps I should carry out my own rationalisation of your 50 pages and out pile, before it heads to the charity shop? 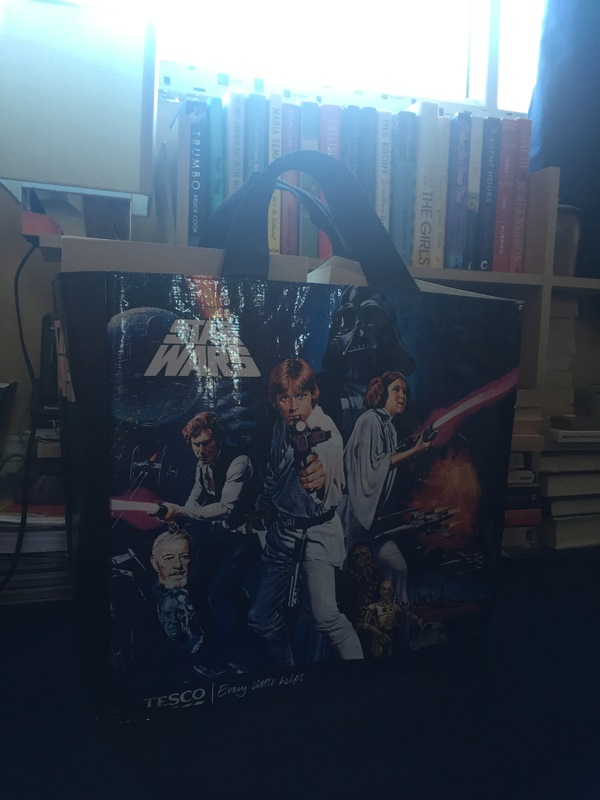 I like your Star Wars bag!